Click here to get directions to Bullbrook Community Hall. Be careful if using a satnav as I found the AA route planner left out the last turn right into the Bay Road with the shops where three Bay Roads meet, see below. Bullbrook Row is a parade of shops in the corner formed by the junction of Bay Road and Lily Hill Road. It can be reached from the London Road in Bracknell via the Eastern Road roundabout which is in between the Met office roundabout and the Running Horse roundabout. Take the north exit from the roundabout and then take the first right. The road from the roundabout to this point is Bay Drive, but often is just called Bay Road too so all three roads at this junction may be counted as part of Bay Road. 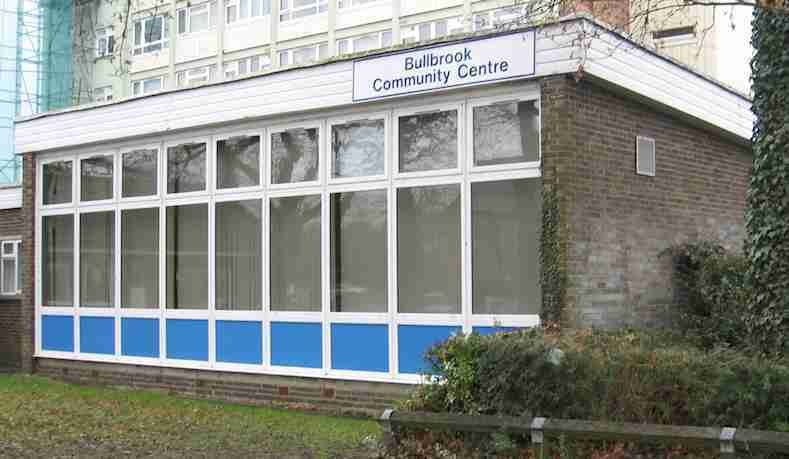 The Bullbrook Community Centre is just before the parade of shops on the left. It has blue panels at the bottom and large windows as shown in the accompanying picture. The entrance is to the right beside the shops. The door should be unlocked, but if not just knock on it, there is no bell, or if nobody seems to be answering knock on the window. There is parking in front as can be seen, and a car park on the others side of the road just before reaching the hall. Click for a map from StreetMap.co.uk to see where the hall is.